Annually in late summer, the law firm Jenner & Block publishes 3 newsletters highlighting women, people of color, and LGBT partners & upcoming attorneys who have notably contributed to the firm’s financial success over the past year. 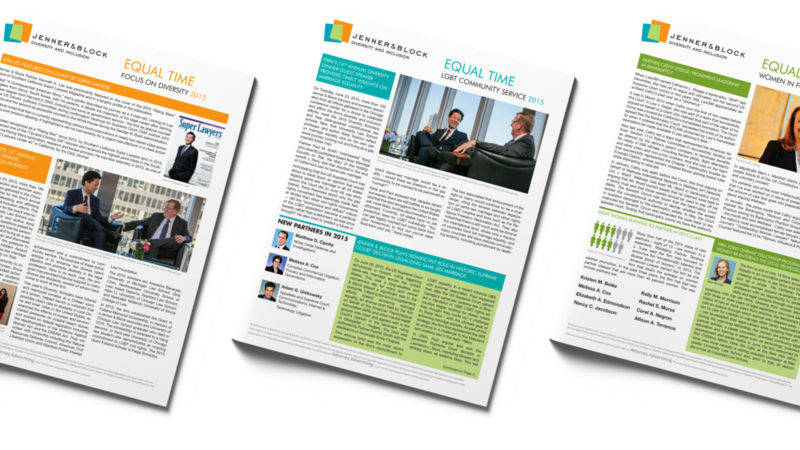 In 2015, I was tasked to create these Equal Time newsletters. Additionally the firm’s diversity department requested a new visual identity be developed in tandem with the newsletters, to replace the outdated branding that was still in use. The identity I created strives to strike a balance between something “fresh” (as requested) while complementing the more conservative Jenner & Block corporate identity.